It has been another successful year for the A. James Clark School’s Society of Automotive Engineers (SAE) Terps Racing teams. The Terps Racing Baja SAE team, which competed in all three 2018 US competitions (in Maryland, Kansas and Oregon), posted strong scores for each of the single’s contests; in every competition, the team ended up only one spot from qualifying for the coveted Design Finals bonus event. The Terps Racing Formula SAE team, which competed in all events in two competitions, placed 92nd out of 114 in Michigan and 39th out of 67 in Nebraska. In the Baja SAE Maryland competition, held April 19–22 in Mechanicsville, the team placed 16th overall, and in the Baja SAE Kansas competition, held May 17–20 in Pittsburg, the team did even better, finishing 15th overall. The team also placed 36th overall in the Baja SAE Oregon competition, held May 30–June 2 in Portland. Between the Baja SAE Maryland and Baja SAE Kansas competitions, the team installed a completely overhauled powertrain system (a new transmission, static-ratio gearbox and gears, differential, and in-board CV-joints) a light-weighted braking system, and new suspension settings designed to complement the team’s differential choice. The Terps Racing Formula SAE team, which competed May 9–12 in Brooklyn, Michigan and June 20–23 in Lincoln, Nebraska, faced manufacture and design challenges throughout the year, but was able to field a competitive vehicle that built upon the successes of the 2017 racing season and competed in all events of both competitions. The team gained valuable experience this year and is very excited for next year’s racing season. It has synthesized the lessons it learned from this season into a set of organizational and engineering goals that will help to build a foundational platform for future success. 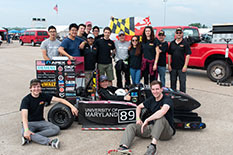 Terps Racing is an organization of about 100 students that design, build, test, and race a formula-style and baja-style racecar in collegiate design competitions each year. Through the design, build, and testing process, students gain experience in computer aided design modeling, finite element analysis, computational fluid dynamics, design analysis and testing and leadership skills. During competition, industry professionals examine the car’s design—from marketability and cost to performance and engineering. For more information about Terps Racing, visit: www.terpsracing.umd.edu.